A Pirate hanged at Execution Dock, Robert Dodd, late 18th century, National Maritime Museum. The illustrator of this piece, Robert Dodd, has been featured on this blog before. Born in 1748, he was active in marine art for much of his life, and created scenes of the Bounty mutiny, warships in the American Revolution, and battles of the French Revolutionary War and Napoleonic Wars. 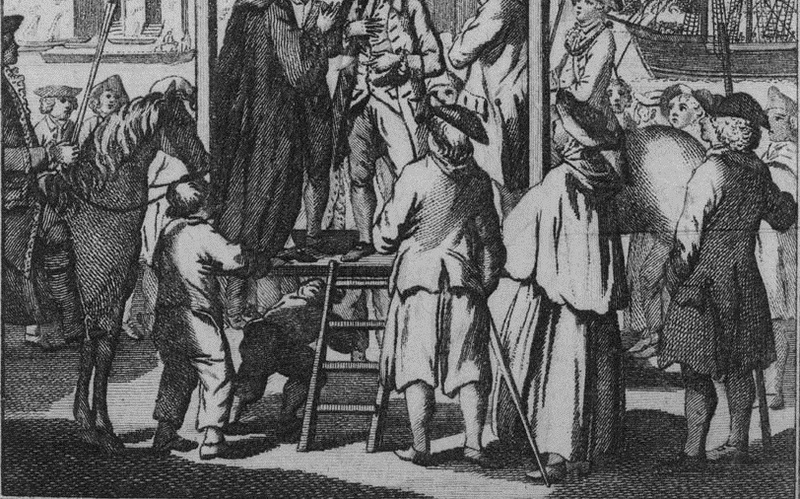 This scene is dated by the curators at the National Maritime Museum as about 1795. I disagree for a couple of reasons. In the first, the clothing of the participants is clearly from the decades before the 1790's. My line of logic on this argument is, admittedly, not strong. 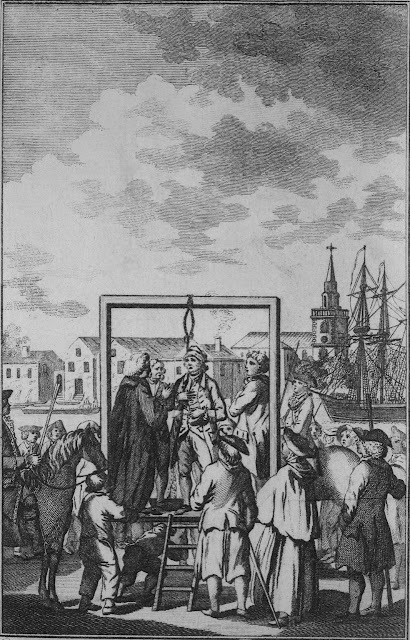 The scene likely depicts the hanging of Captain James Lowry for the murder of Kennith Hossack. A notorious crime, it was talked about long after Lowry's body was strung up. A stronger line or reasoning stands in the engraver, Lieutenant Page. He created several maps for the British during the American Revolution, during which he served as an aide de camp to General Howe. With both of the parties involved known for their work during our period of study, and the subject well within it, I think it is safe to move the suspected date of the work back a decade or more. Execution Dock rests in the neighborhood of Wapping. 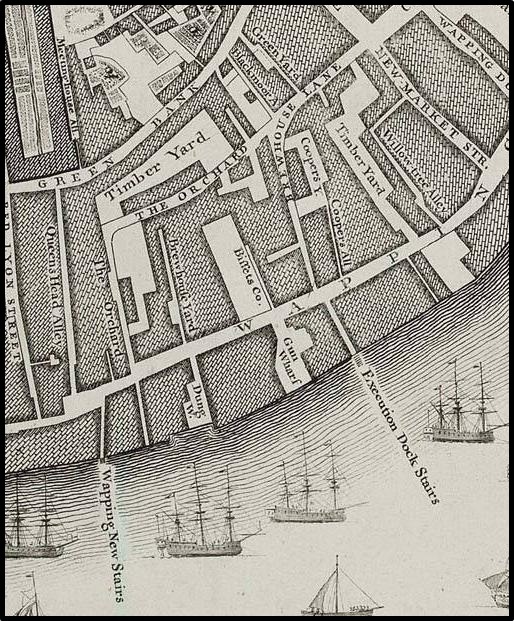 Known as a sailor's community in London, executions carried out here fell within the jurisdiction of the Admiralty Court. In the detail below, you can see a man on horseback bearing a silver oar. The silver oar was the symbol of the Admiralty Court, and led the procession of the convicted to the gallows. Convicted criminals, like Captain James Lowry, were strung up at low tide, so that their bodies would be enveloped when the tide came in. Execution Dock served as a harsh symbol of the authority and jurisdiction of the Admiralty. The figure with the noose around his neck is wearing the clothing of a gentleman (which lends weight to the assumption that he is Captain Lowry). The crowd, though filled with all sorts, is checkered with sailors. Just to the right of the center is a tar in a cocked hat of indeterminate angle, with wavy hair that ends right at the base of his neck. A plain neckcloth is gathered over his jacket, which is triple vented and ends about the top of his thighs. Petticoat trousers running to the top of the calf reveal white stockings. Next to the horse, to the left of the taller sailor, is a younger (or at least much shorter) jack. Either bare headed or wearing a knit cap, his jacket is tucked into the waistband of his plain white trousers. A neckcloth is also tied about his neck, and he too wears white stockings.